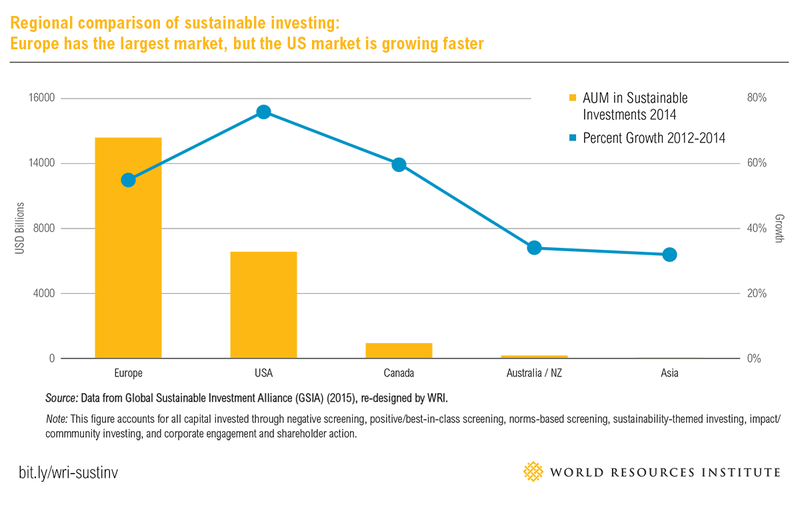 A new paper by World Resources Institute finds strong interest and opportunities for sustainable investing within the US institutional investor marketplace. But key barriers persist. A survey of over 100 investment professionals shows that institutional investors – including pensions, foundations, universities, and NGOs – are increasingly considering the material importance of social, environmental, and governance factors in constructing their portfolios. While a desire to align investment with mission or stakeholder pressure drove most early movers to sustainable investing, economic drivers are making sustainability an issue that long-term investors simply cannot ignore. As their interest grows, investors are finding more support in pursuing sustainable investing. 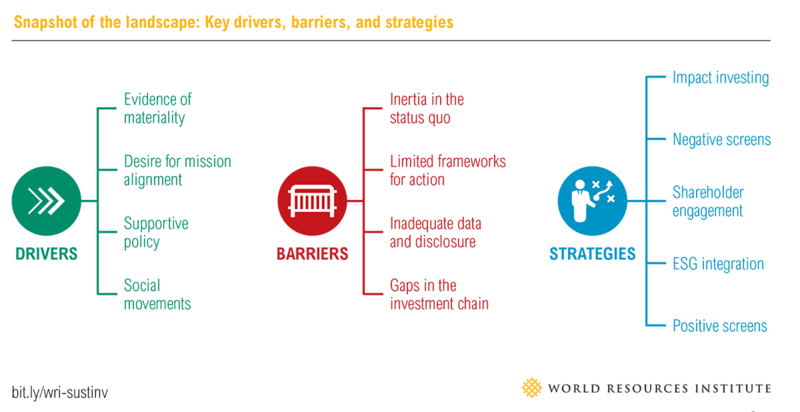 Despite the enthusiasm and more capital flowing, WRI found key gaps in the market that prevent even the most motivated asset owners from deploying capital sustainability. For those starting on their journeys to sustainable investing, this paper provides insights into common questions and challenges investors will need to grapple with. It also provides initial steps investors and their partners can take to overcome barriers and advance in the market. Global natural resource scarcity, climate change, population growth, demographic shifts, and extreme poverty are impacting the way investors view the future. Many already recognize the materiality of such risks to long-term portfolio performance and are starting to incorporate relevant environmental, social, and governance (ESG) factors into decision making in building a portfolio. With thoughtful implementation, these sustainable investing strategies have a positive, or at least non-negative, association with financial performance over the long term (Friede et al. 2015; Trunow and Linder 2015; Mercer 2009; Morgan Stanley 2015a), while also generating co-benefits. But the landscape for sustainable investing is changing rapidly and is difficult to navigate. For most asset owners, it isn’t easy to translate consideration of long-term sustainability into portfolio investments. This paper informs asset owners about the current state of sustainable investing for US institutional investors. Drawing on the experiences of over 100 asset owners and investment professionals—as well as evidence from WRI’s own endowment—the paper constructs a detailed outline of sustainable investing. It highlights the underlying motives and drivers, governance structures, relevant data and standards, investment vehicles, and key barriers that shape opportunities for implementation. It describes how some US-based asset owners are pursuing sustainable investing, and distills lessons for investment practitioners as they contemplate their own strategies. The paper concludes with initial recommendations for asset owners in overcoming preliminary market barriers and strategic steps other market actors—including asset managers, advisory firms, data providers, and investor networks— can take to support sustainable investing. The findings are targeted to the early adopters of sustainable investing in the United States: foundations and other endowed asset owners. These asset owners share a common dependence on endowments to support their mission over the long run. For them, sustainable investing can help secure financial stability far into the future, while also supporting their programmatic purpose through investment strategies broadly in line with their social and environmental values. But the appeal is not exclusive to this audience. While mission-driven investors have added reason to consider sustainable investing, the practice has relevance for all long-term investors, even those with a “finance first” orientation. Values aside, sustainable investing is simply a means of expanding the investment analysis to account for a broader set of material long-term risks and opportunities. This is a strategic advantage for any institutional investors with a long-term investment horizon. While this paper seeks to inform all investors that are contemplating sustainable investing, as the first movers it is mission-driven asset owners that come into greatest focus. We identify a number of forces driving asset owners’ interest in sustainable investing. The leading driver is financial in nature: growing evidence of the material link between positive ESG performance and corporate financial performance. This link is only strengthening in a changing macroeconomic landscape. As businesses navigate the current and expected forces of population growth, demographic shifts, resource scarcity, climate change, and other related trends, the way in which they manage ESG risks and opportunities becomes increasingly relevant to their bottom lines. At the regional, national, and global levels, meanwhile, the policy framework for sustainable investing is increasingly supportive. Evolving environmental, social and governance regulations are making certain externalities more immediately material to companies and, therefore, investors. The policy driver most commonly cited by investment professionals is the UNFCCC Paris Agreement (supported by President Obama’s National Climate Action Plan on mitigating carbon pollution). Other regulations pertain directly to investors and their ability to incorporate ESG into investment decisions. This includes the 2015 Department of Labor ruling that clarifies ESG as an appropriate component of fiduciary duty for retirement pension plans. At the same time, social norms are creating pressure for institutions to align their investments with their mission and values. In some cases, these norms are reinforced through legal codification—as with recent guidance by the Internal Revenue Service and the Department of Labor. The norms—policy-supported and otherwise—are particularly relevant to mission-driven institutions like foundations and endowments, since these institutions have clear social missions and values. Growing social movements, like the fossil fuel divestment campaign, both reflect and reinforce these broad norms for mission alignment. These campaigns are driving increased scrutiny regarding the social, political, or economic implications of investment holdings—even those beyond the narrow focus of a given campaign. These drivers are leading increasing numbers of asset owners to employ various strategies for sustainable investing. While the definitions of relevant terminology are not yet standardized, for the purpose of this paper we use “sustainable investing” as an umbrella term for all investment practices that consider ESG factors to inform decision making. 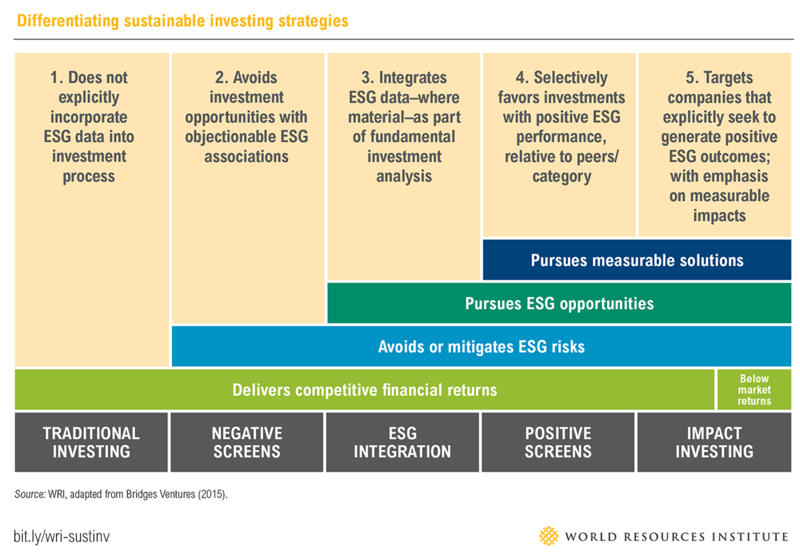 The commonly pursued sustainable investing strategies fall within five main categories: negative screens, positive screens, ESG integration, impact investing, and shareholder engagement. Asset owners are implementing these strategies—which can be overlapping— in a variety of ways according to their investment objectives. Often, they begin the sustainable investment journey by applying one strategy—generally negative screens or impact investments—in a designated portion of a portfolio or a single asset class. More advanced or experienced asset owners may integrate a holistic strategy across an entire portfolio. As more asset owners consider sustainable investing as a means to drive outperformance in long-term returns and align endowment assets with institutional mission, the investment ecosystem is becoming increasingly supportive. We identify an improving selection of sustainable investment opportunities, as well as the information to evaluate them. These positive developments include a range of supportive products and services, including (a) the growing availability of ESG data and analytics to inform decision making; (b) new sustainability-themed market indices; (c) improving disclosure standards; (d) new investment frameworks; (e) more peer networks; (f) more managers offering sustainability strategies; and (g) more knowledgeable investment consultants. False perceptions and cynicism about sustainable investing. Many investment professionals are convinced that sustainable investment leads to adverse investment consequences. Short-term biases. A focus on short-term performance frequently leads investors to overlook material ESG issues that can play out over time. Decision paralysis. Asset owners—even those committed to sustainable investing—are commonly paralyzed by philosophical discussions that inhibit action. Misconceptions about fiduciary duty. Many investment professionals believe that incorporating sustainability factors into decisions conflicts with fiduciary duty, despite regulations to the contrary and despite evidence that ESG integration can be a form of prudent investing. Absence of accountability in decision making. The governance of investment management decisions in endowments can be diffuse and unclear, resulting in an uncertain decision-making process. Even when asset owners finally have a mandate to begin investing sustainably, they find it challenging to translate their goals into the investment portfolio. The act of putting their vision into practice is made difficult by an absence of actionable frameworks. Investors are responding to market signals from new policy initiatives like the Paris Agreement and the Sustainable Development Goals, but they still lack clear frameworks to fit their entire investment portfolios into the future world envisioned by these aspirations. An asset owner may have momentous goals, but the path is uncharted. Further, ESG data, disclosure standards, and performance metrics are inadequate. While reams of ESG data exist, key limitations restrict their broader use in mainstream investment decision making. First, asset owners face uncertainty in simply identifying which ESG factors are material to performance in a given portfolio. Beyond this hurdle is the challenge of securing reliable data to measure those factors. Global and comparable data sets for ESG indicators are both scattered and inconsistent. Many efforts are underway to develop standards for corporate disclosures on key ESG issues, but their overlapping and (mostly) voluntary nature lead to inconsistency and confusion in implementation. These gaps can make it difficult for asset managers to perform comprehensive due diligence that includes ESG. Lastly, there are persistent gaps and weak links in the investment chain. 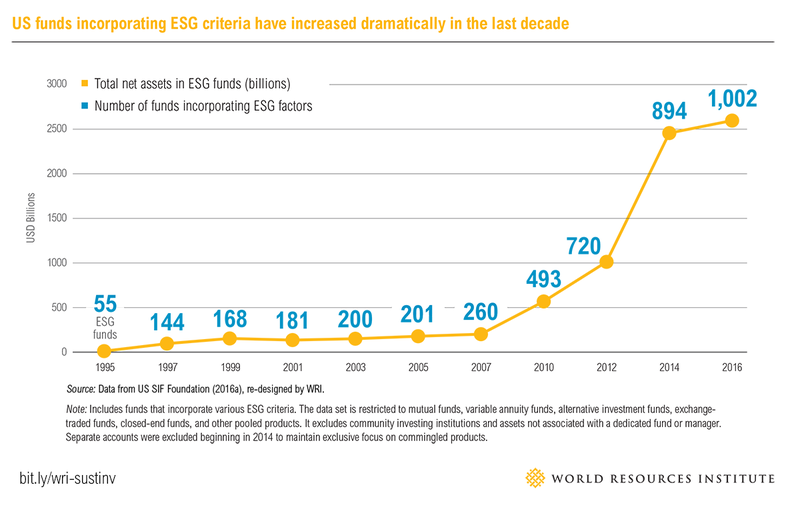 Asset owners increasingly try to move beyond negative screening and seek to be more holistic and proactive, but there are limited high-quality funds that integrate ESG criteria. While investment consultants are becoming more educated about sustainable investment and managers are developing new products, structural disincentives often limit interest in considering new long-term factors or proactively offering sustainable investment products to clients. Initial actions for asset owners US foundations and endowed asset owners can take a number of steps to navigate the barriers of the sustainable investing landscape. These include: Knowledge and capacity building. The best place for asset owners to start is with internal education. It is important for decision makers within an organization to have a common understanding of several topics, including (a) the underlying premise of sustainable investing, (b) the materiality of ESG factors to financial performance, (c) the implications of sustainable investing for fiduciary duty, (d) how sustainable investing fits into the investment process, and (e) how to evaluate investment opportunities, among other topics. An internal champion equipped with this knowledge can provide coherency and leadership in an uncertain process. Strategic delegation. 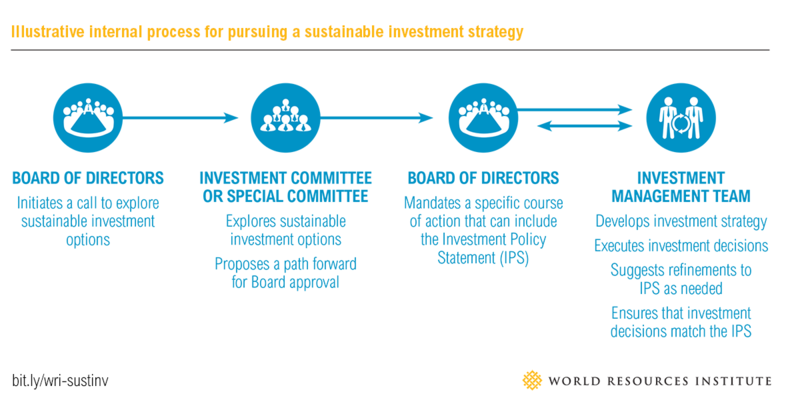 In making initial decisions to pursue sustainable investing, asset owners may find it useful to establish a separate working group or special committee within the investment committee. This will allow time and resources to cultivate a shared understanding of the relevant issues and to devise a broad approach for the institution’s strategy. External engagement. Discussing issues of sustainable investing with investment consultants, managers, and peer asset owners can be a crucial part of the learning process for asset owners. These conversations can help inform asset owners about the various debates on relevant topics, the range of sustainable investing strategies available, and potential opportunities or limitations. 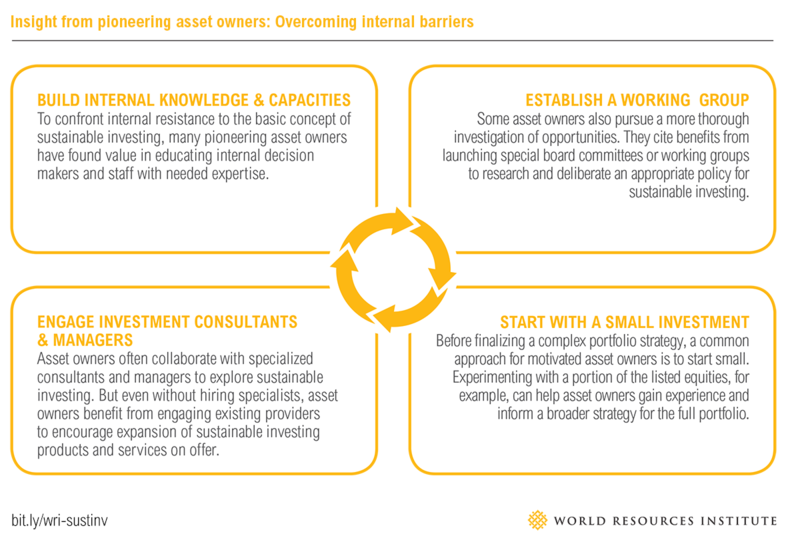 Asset owners can also use these conversations to encourage managers and consultants to improve their sustainable investment practices or offerings. Portfolio experimentation. Before finalizing a grand strategy or making long-term commitments across a portfolio, asset owners can consider exploring the landscape by investing a portion of the listed equities allocation into sustainable investment funds. Listed equities are a good starting point both because of the liquidity of the asset class and the fact that sustainable listed equity funds are more readily available than those in (some) other asset classes. Asset owners can learn from this process while they reach agreement on an appropriate sustainable investment strategy for the broader portfolio. Guidance for investment decision makers. Useful materials include a roadmap for integrating sustainability into endowment management, and detailed resources on common roadblocks within the process such as effective governance strategies and fiduciary duty. Improved ESG data and performance metrics. Improvements should focus on data quality, consistency, coverage, and accessibility. Actionable investment frameworks. New investment frameworks should be built around concrete sustainability goals and performance standards and supported by robust methodologies for achieving them. 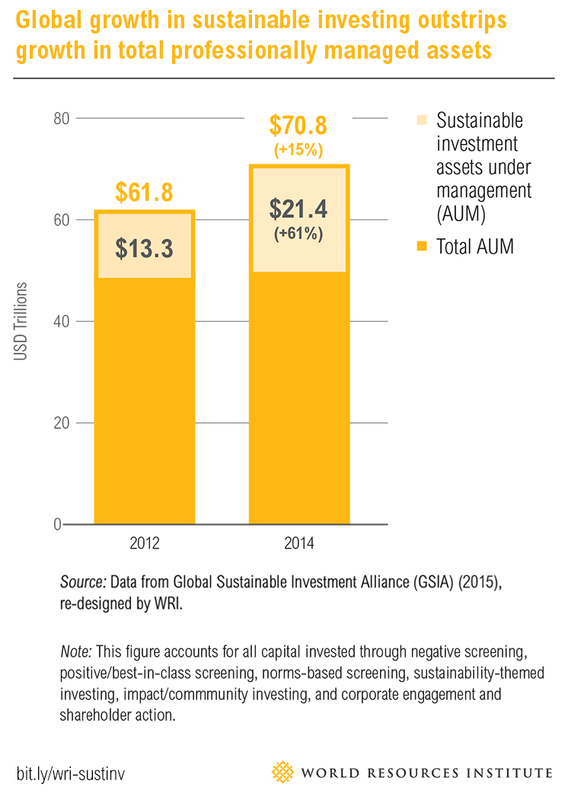 Greater supply of institutional-quality sustainable investment products. New products are needed to cover the full range of asset classes. Something very important is happening in global finance: the $70 trillion in institutional investment pools is turning a little greener. More than $8.7 trillion of investment capital in U.S. markets is managed using environmental, social and governance factors, a 184 percent increase since 2010. Despite some lingering skepticism, new research shows sustainable investing is on a strong path forward.